Artists like Janelle Monae make music genre classification futile. Equal parts James Brown funk and Outkast spacey-ness, the 24-year-old Kansas City native redefines R&B and hip-hop on her full-length debut, and in the process, may revolutionize pop music as a whole. 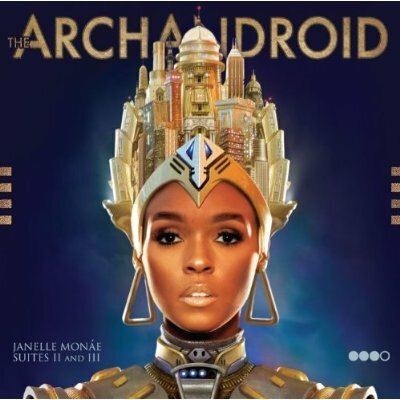 The ArchAndroid (Suites II and III of IV) continues the tale told on Monae’s 2007 EP, Metropolis Suite I of IV: The Chase. The story, based loosely on Fritz Lang’s 1927 sci-fi film Metropolis and influenced by other seminal dystopian movies like Blade Runner, features Monae’s alter-ego Cindi Mayweather, an android on the run after falling in love with a human. Whereas Suite I blatantly pushed the narrative on the listener, The ArchAndroid is more ambiguous thematically, instantly making the music more accessible. Throughout, Monae weaves in and out of every style of music imaginable, highlighting her soaring, soulful voice. “Cold War” is a cousin to Outkast’s “B.O.B.,” pairing frantic drums and wailing electric guitars with a haunting message: “This is a cold war, you better know what you’re fighting for.” Meanwhile, “57821” (the android’s model number), sounds like a Simon & Garfunkel outtake from The Graduate, and “Sir Greendown” is what a phonograph would play if the glitz and glamor of ’30s Hollywood took place in outer space. Monae isn’t afraid to let loose and just have fun, though. “Come Alive (The War of The Roses) pays musical tribute to the B-52’s. And it’s impossible not to dance to “Tightrope,” the album’s first single. With an extended horn section outro and guest vocals from Outkast’s Big Boi, the track reeks of funk. With such a far-reaching variety of musical influences, The ArchAndroid is a bit dysfunctional. But between the recurring sci-fi motif and the clever blending of every song into the next tracks, Janelle Monae proves that you don’t have to conform to the music industry to strike it big. So did Puffy dicsover her? Or does he manage her? I’m surprised he hasn’t destroyed her and put her in a shiny suit.